Don't forget to grab calcium, bucket #2 for the complete set! B-Ionic Calcium Buffer is the original, unique, easy to use, two-component liquid supplement system, which does not contain any organic compounds. It solves many of the problems associated with other forms of calcium and alkalinity supplementation. 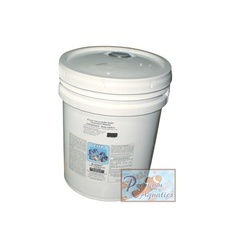 This product was developed as a result of our new approach to aquarium additive formulation, "Balanced Ion Technology". * 40 times more calcium than saturated kalkwasser solution. B-Ionic Calcium Buffer is sold as a unit. When used as the sole source of calcium and alkalinity, ESV recommends daily additions of 1 ml. of component 1 and 1 ml. of component 2 per 2 gallons of aquarium water. As a calcium and alkalinity booster for aquaria using kalkwasser, ESV recommend half that dose. Since each aquarium has its own unique dynamics associated with calcium and alkalinity depletion, these dosages can vary as dictated by calcium and alkalinity test results. In general, ESV recommends maintaining 3.0 - 3.75 meg/L alkalinity and 400 - 450 ppm calcium ion concentration. Since B-Ionic Calcium Buffer is in liquid form, additions to the aquarium are quick and simple (no mixing or measuring of powder involved). The time required is usually less than the time it takes to feed your fish.
. Product is half full concentrate, add RO or DI water to marked levels.